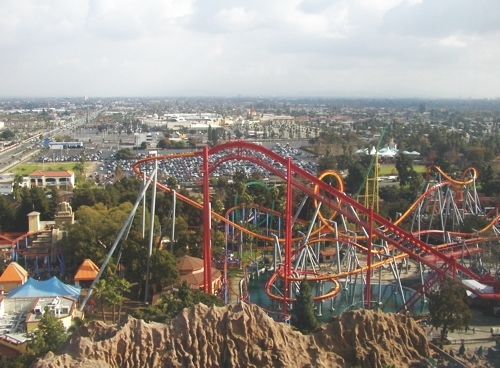 Located in Buena Park, Knott’s Berry Farm is America’s 1st Theme Park. It started as a farm selling the homemade preserves of one Mrs. Cordelia Knott. Although Ma Knott and her family are long gone, her jams are still on sale. Besides the jams, is is the extreme roller coasters, Camp Snoopy, family attractions and an old ghost town that bring visitors from all over for hours of fun. Parts of Knott's Berry Farm aim to portray an idealized, kinder America than you might find at, for example, Universal Studios. Some charming remnants of the park's early years remain: most notably in the Ghost Town section, which contains a number of buildings that have been transplanted from old mining towns. Ultimately, though, the thrill-seekers win out over the sentimentalists thanks to a number of water rides, the stomach-churning Xcelerator and Montezooma's Revenge attractions, and two new rollercoasters: the Sierra Sidewinder and the Pony Express. Route 18 will take you right to the front of the Knott's Berry Farm MarketPlace. The Buena Park Metrolink station is only minutes from the park. Opening time is different depending on the time of the year but generally from 10 am to 5 pm. Unlike in traditional zoos where the day-night cycle of animals has been reversed, Night Safari gives the chance to see what the night animals are really up to during nighttime. Happy Valley Shanghai is the newest and most western type of amusement park in Shanghai. The area is clean, services are good and the selection of rides is not bad either. The Tierpark Hagenbeck is the official name of the Hamburg Zoo. It was built in the early 20th century, but was destroyed in an air raid during the WWII. The Bronx Zoo is the largest metropolitan zoo in the United States, comprising 265 acres (107 ha) of park lands and naturalistic habitats. The highest observation tower in the USA is Las Vegas’ Stratosphere. The tower rises about 350 meters to the sky and is used as a luxurious hotel and casino. It is the northernmost of all the venues of the Las Vegas Strip. Miami Seaquarium is the oldest oceanarium in the USA and one of the most important in the world, with over half a million visitors per year. Its area is over 39 acres and is located near the Miami City center.